In the last several weeks, President Obama has been using some high-profile speeches and events to make a big push for prison reform. The president is also working with both Democrats and Republicans on this issue, among them some major Republican politicians who normally oppose his views. 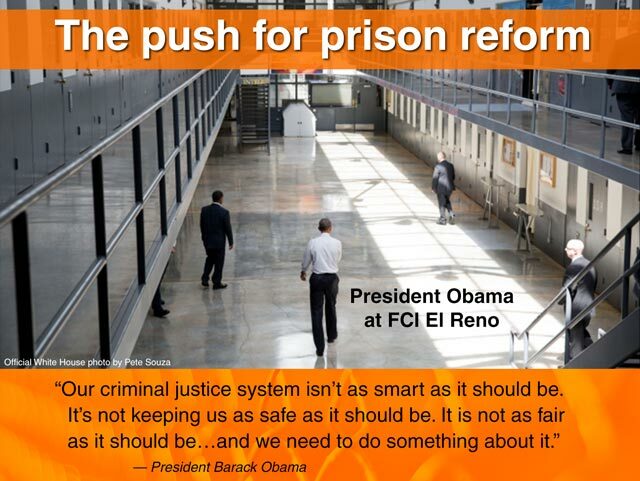 The president kicked off this effort by commuting the sentences of 46 prisoners. This means all of these people will be let out of prison for the time they have already served and will not have to serve the rest of their sentences. These people were all convicted of non-violent drug-related crimes. Some of them had been sentenced to life without parole. President Obama explained his actions by saying that they had received unfairly long sentences in the first place, and deserved a second chance. The president has now commuted the sentences of 89 non-violent prisoners during his term. Obama followed this up with a stirring speech in Philadelphia. This speech to the NAACP touched on many different parts of the criminal justice system, including unfair practices in sentencing, overcrowding, and more. He also gave credit to Republican Senator Rand Paul and other conservative leaders for their prison reform efforts. President Obama became the first sitting president to visit a federal prison when he toured the Federal Correctional Institute in El Reno, Oklahoma. There, he talked with prisoners as well as administrators. Most people now agree that the U.S. prison system needs to change. Today, about 2.3 million Americans—almost one percent of the total U.S. population of 300 million—are in prison, the highest number of any nation in the world. China, with a population of 1.4 billion people. has 1.6 million prisoners. Although the U.S. only contains five percent of the world’s population, its prisons and jails hold 25 percent of all the world’s prisoners. This has not always been the case. 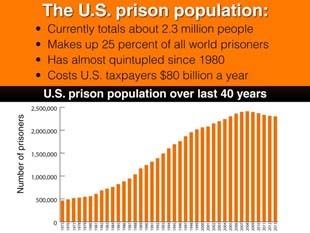 In 1975, the prison population was just under 500,000. But this began to change a lot in the 1980s, when the federal government started a big push with its “War on Drugs.” This effort resulted in a huge increase in incarceration rates for drug users and dealers. Then, in 1994, President Bill Clinton signed a law that led to repeat offenders getting much longer prison sentences. Many states enacted “Three Strikes” laws, setting long sentences for anyone with three felony convictions. These sentences became mandatory, meaning judges had to impose them, even if the circumstances called for a lesser sentence. Keeping 2.3 million people locked up costs U.S. taxpayers 80 billion dollars every year. As the president has said, this could pay the tuition of every student in every public college in the country. But this sharp rise in the prison population also takes another kind of toll. Although African Americans and Hispanic Americans only represent 30 percent of the total U.S. population, these groups make up 60 percent of U.S. prisoners. These groups are more likely to grow up in poverty, one of the biggest risk factors for criminal behavior. Studies also show that blacks and Hispanics are arrested more often than white people who commit the same crimes. They also receive much longer prison sentences for the same crimes, and are much less likely to be paroled. 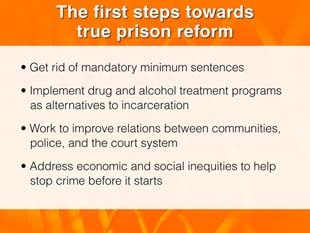 The push for prison reform has led to many different proposals from lawmakers, candidates, and human rights advocates. But there are some ideas on which just about everyone seems to agree. One of them is that mandatory sentencing and “Three Strikes” laws must end. Politicians from both parties agree that these laws have not worked. One of them is Bill Clinton, who has apologized for signing the original law that led to these policies when he was president. Another bipartisan effort is focused on the treatment of drug and alcohol addicts. For decades, drug possession has led to long-term prison stays instead of meaningful help. Texas and some other states have had great success in sending non-violent drug and alcohol offenders to treatment centers instead of prison. This model works better, and is also much less costly. Many people welcome these changes, but say we must also look at the role that police officers and the court system play in the prison explosion. Several candidates are using the phrase “smart policing.” This means that police and others involved in law enforcement need to listen to and work with communities. Finally, many experts say that the best way to reduce the prison population in the U.S. is to stop crime before it starts. This means providing more opportunities to people in high-poverty areas, including better jobs and housing, safe childcare, and good education from pre-school through college. Next The Place I Call My Motherland: My Summer in India by Sonali C.